/ How Do I Create a Twitter Tweetstorm? How Do I Create a Twitter Tweetstorm? My boss has told me that I need to prepare a “tweetstorm” for a client. Is there a smarter way to do that than a lot of fast copy and paste? Let’s start with some definitions. A tweet storm — or more accurately tweetstorm — is a series of tweets on Twitter that together assemble into a single message or commentary. It’s primarily used when a single tweet just isn’t enough for the message, though perhaps tweetstorms are going to become a bit less popular now that your tweet can be twice as long as in the old days? Ahhh, probably not. People like to be longwinded, even in a channel where brevity is not only the soul of wit but the heart of the design. 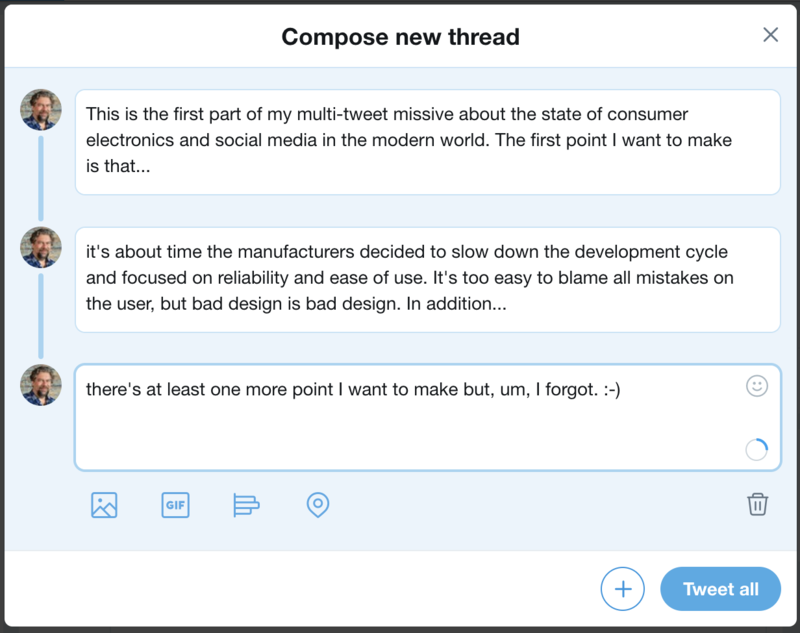 Though there’s a sense that tweets on Twitter are just typed and shared without much planning, companies and organizations actually do pay a lot more attention and plan ahead. The end result is that there are a lot of copy > paste > post cycles and you’re spot-on that the standard way to push out a tweet storm is to do that as many times as needed, as fast as possible. 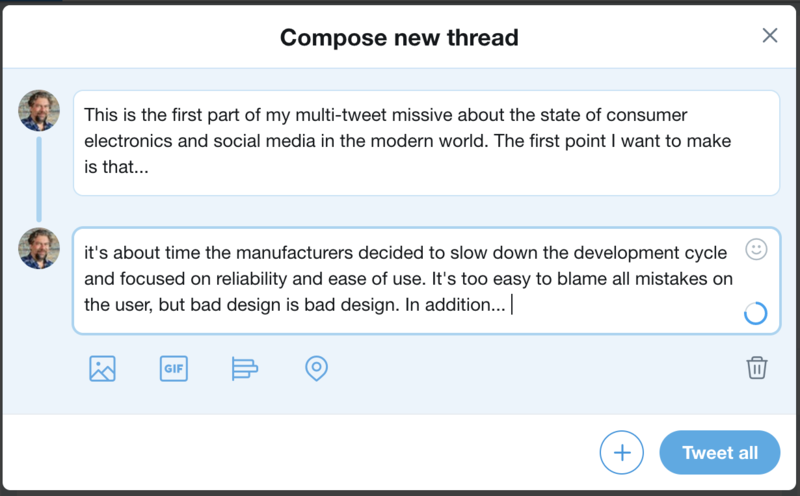 Twitter feels your pain, however, and now there’s a slick tweetstorm feature built in to the Twitter Web interface that makes it a breeze, whether you’re sending out just a couple of tweets in this storm or whether it’s the Great American Novel, sentence by sentence. Let’s have a look! Interestingly, there’s no character counter in this new version, it’s a circle that slowly fills in on the lower right of the input window. Emojis can be added by clicking on the smiley (top right), and, left to right, the buttons along the bottom left are for adding a photo or video, adding an animated GIF, creating a poll or checking in to a venue or location. Ready to go? Click on “Tweet all” and they will be published one after the other, rapid-fire! It’s even in the right order! Easy enough, and way better than copy > paste > post! 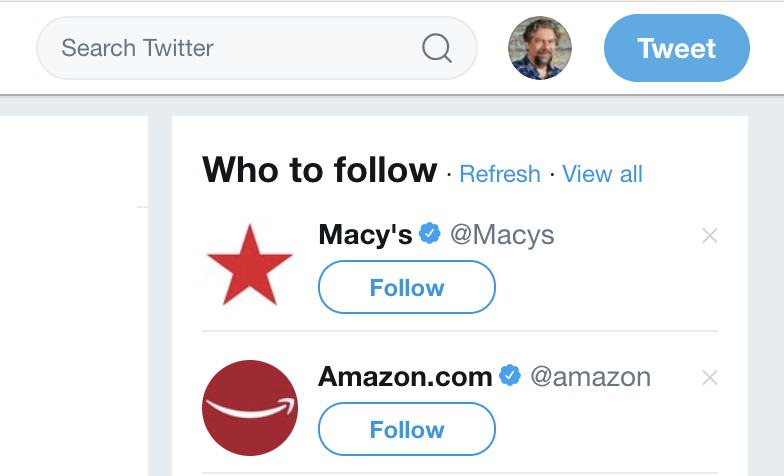 Pro Tip: While you’re here, please check out all my other Twitter help and don’t forget to follow @DaveTaylor on Twitter too! It’s not that great a feature and they seem to be blocking tweetstorm sites so you can do it without Twitter’s buggy implementation. I’ve used the Twitter tweetstorm a number of times for a long tweetstorm, got to the end, and the Tweet All button doesn’t work. It always seems to happen on subjects Twitter doesn’t like so I’m starting to think it’s tied into their idiotic censoring algorithm.